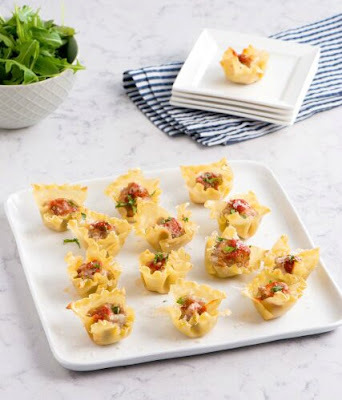 This appetizer version of pasta and meatballs is fun for kids and adults alike. The meatballs are made with ground chicken, but you can substitute ground turkey if you like. This is a guest post recipe that's courtesy of PastaFits.org and will make approximately 12 servings. 2. Preheat oven to 400˚F. Combine chicken, egg, bread crumbs, 1 tbsp. parsley, garlic, Worcestershire sauce, salt, pepper and oregano. Shape and roll into 24 mini meatballs. 3. Lightly grease 24-cup mini muffin pan. Cut small slits into each corner of lasagna noodle square. Fit squares into muffin cups. Place meatballs inside and top evenly with tomato sauce, mozzarella and Parmesan. 4. Bake for about 15 minutes or until meatballs are cooked through and cheese is melted. Sprinkle with remaining parsley before serving.